Although the title of this essay seems like the title of one of Stephanie Barron’s Jane Austen detective novels, the discussion here is about two very real people: Jane Austen (1775-1817), the author—not the fictional character of Barron’s fertile imagination—and Britain’s first master spy, William Wickham (1761-1840), head of the British secret service. There is no suggestion that Jane Austen was a spy or was in any way involved in espionage, but Austen’s appropriation of the name Wickham for her villain in Pride and Prejudice is certainly highly suggestive. Jane Austen’s first readers would have immediately connected the surname Wickham with deception, secrets, spies, and disappearing money, giving Austen’s contemporaries an early clue as to George Wickham’s duplicity, which her modern readers miss. And George Wickham’s fate in Pride and Prejudice—that is, his transfer into the regular army—was actually what military commanders were advocating for the British secret service. The Duke of Wellington and Admiral Lord Nelson wanted personally to control British espionage, but to accomplish that was to wrest the organization out of the hands of William Wickham, Britain’s master spy. As Janine Barchas in Matters of Fact in Jane Austen and Margaret Doody in Jane Austen’s Names have noted, Austen repeatedly selected names for her fictional characters that conveyed meanings to her readers. Barchas maintains that Austen’s “fictions persistently allude to real people . . . from high profile politicians” to “outrageous Regency celebrities” (1-2). William Wickham was a high profile Whig. According to Doody, “persons [Austen] imagines always have a place upon the earth—the literal earth” (18), and both Barchas and Doody have done extensive research into the real people who lend their names to Austen’s fictional characters. Neither Barchas nor Doody, however, has mentioned William Wickham as the source of Jane Austen’s fictional George Wickham, although the connections between Austen’s scoundrel and the head of the British secret service seem to further prove their point. In associating Pride and Prejudice’s George Wickham with a master spy, Austen was not attempting to create a swashbuckling figure such as Ian Fleming’s James Bond. At the time of the novel’s composition and publication, the connection would have had the opposite effect. In Jane Austen’s day, the British secret service was a new and extremely controversial organization. As Terry Crowdy in The Enemy Within: A History of Espionage notes, “Britain’s military intelligence services were then at an embryonic stage” (152), and the secret service had not yet captured the public’s imagination or gained their approval. The general consensus was that spying was “un-English” (Durey, Master Spy 33; “Christ Church” 715). Espionage was, in fact, French, and no true English gentleman would stoop to the deceptions necessary to carry out the job. Historian Michael Durey maintains that “spies violated the gentleman’s code, with its emphasis on candour and openness as respected values” (Master Spy 33). As the ultimate English gentleman, Fitzwilliam Darcy says in Pride and Prejudice, “‘disguise of every sort is my abhorrence’” (PP 192). According to Durey, “in Britain the secret service was viewed as a temporary wartime expedient, part of a war machine to be wound down as swiftly as possible” when the war ended (Master Spy 135). The secret service was allocated an expense account, but Parliament—unknowingly—also funded the secret service through several government agencies and as a military expenditure. Exactly how much tax money was funneled into the secret service was just another one of the organization’s many closely-guarded secrets. Working as an English diplomat in Geneva, Switzerland, in 1793, William Wickham organized a large and complex spy ring of French agents and double agents. According to Wickham, the best spies were double agents, Frenchmen operating as spies for the French government who also sold their secrets to the British. A dangerous occupation, it was a lucrative trade for the spy, and Wickham had to pay well in order to tempt a Frenchman into turning traitor. At the insistence of the French, the Swiss government deported Wickham in 1798; he returned to England and continued working as head of the secret service. Well over a million pounds was funneled to Wickham through a number of government agencies, and internal audits of the Foreign Office showed that Wickham used a complicated network of foreign banks to launder money. In Secret Service: British Agents in France 1792-1815, Elizabeth Sparrow maintains that “Wickham took care to diversify his bank accounts, and by passing the funds for secret agents through a variety of names, he was able to conceal both the origin and the final recipient of the funds” (46). Wickham claimed his secrecy was in the national interest. Auditors in the Foreign Office spent more than twenty years trying—without success—to unravel Wickham’s complicated accounts before abandoning the effort in 1816, but only after Parliament had enacted legislation to prevent such “runaway, unexplainable expenditure” in the future (Sparrow, Secret Service 377). Pride and Prejudice’s villain, George Wickham, not only shares the master spy’s last name, his good looks, and charm but also his cunning and duplicity. While George Wickham has the appearance of being an officer and a gentleman, of being patriotic and honest, he is as double dealing and as untrustworthy as any secret agent working undercover. George Wickham’s first conversation with Elizabeth Bennet is actually more of an interrogation than a social exchange. Wickham asks Elizabeth a series of questions and provides her with a great deal of disinformation, first finding out what Elizabeth Bennet already knows and does not know about Mr. Darcy and then supplying her with a series of half-truths and lies to fill in the gaps in her knowledge. And Elizabeth is not the only young woman to fall prey to Wickham’s powers, as he also charms Miss Darcy, Miss King, and Lydia Bennet. Handsome, clever, and charismatic, William Wickham similarly used his personal charm to ingratiate himself. As Michael Durey puts it in William Wickham, Master Spy, “[W]ell known . . . for his smooth social skills and politeness,” William Wickham “was, in public at least, always acting a part. As a spymaster, he was to become a man acting a part, acting a part” (13-14). The first British spies were employed by Henry VII, but their job was to spy on the King’s own family, not on other countries. The first British spy in a foreign country was Sir Francis Walsingham, Queen Elizabeth I’s Ambassador to France. Walsingham was a rank amateur, but he nevertheless uncovered an invasion plot and tipped off the Queen so that she was able to prepare for the Spanish Armada. After Walsingham pocketed the incriminating documents, diplomacy and theft became synonymous terms, and no one was particularly surprised to find a diplomat rummaging through someone else’s desk or reading other people’s letters. But British diplomats remained amateurs. There were no highly-trained James Bonds among them. The diplomatic corps was filled by younger sons, brothers-in-law, nephews, friends, and old school fellows who saw their diplomatic postings as paying their dues before getting more desirable government appointments at home. The French, Germans, and Russians, however, were professionals. Richard Deacon in A History of the British Secret Service maintains that “where the British had been amateurish, haphazard and empirical in their espionage, the French had been methodical, disciplined and ruthless” (97). The French’s professionalism was apparent in every aspect of their espionage. For instance, the French developed the best codes and ciphers in the world (Deacon 145). Napoleon Bonaparte acted as his own head of the secret service, known in France as “the secret part” (Crowdy 135). Although Napoleon devoted a surprising amount of time to reading daily intelligence reports, he had no personal respect for his own spies and expressed the same aversion to the profession that the British shared. According to the Emperor, “[T]he spy is, by his nature, a base character . . . unaffected by ideas of patriotism, . . . invariably a man of at least quasi-criminal proclivities, a being entirely lacking in a moral sense, a degenerate” (qtd. in Grant 20). Napoleon’s best spy, Karl Schulmeister, was also a smuggler (Grant 60), but then spying itself was a criminal activity and a hanging offense. In Britain, Prime Minister William Pitt the Younger considered what he referred to as “the under game” to be regrettably necessary for the war effort (Sparrow, Secret Service 140). Pitt’s main problem with espionage was that he was hesitant to get his own hands dirty in the business, so he delegated responsibility to the Foreign Office. Thus, Pitt only knew what the head of the Foreign Office, his political opponent Lord Grenville, decided to tell him. Grenville appointed his old school friend from Oxford, William Wickham, to be head of the secret service, although Wickham had absolutely no experience or qualifications for the job. In How William Wickham Helped to Save the British Empire, Andrew Schuller maintains that his “appointment to one of the most important diplomatic posts was sensational considering Wickham’s youth and inexperience” (7). In A History of the British Secret Service, Richard Deacon notes that the Foreign Office drew a clear distinction between the spy master and his minions: “Lord Grenville assured Wickham that his mission was ‘an honourable task and not simply a form of spying’” (94). Grenville and Wickham carried on a secret correspondence, in alpha-numeric code (Crowdy 114-15), so secret that the Prime Minister was unaware of it (Schuller 5). Wickham adopted a number of aliases for his correspondence, including “Votre Pere,” “Rustique,” and “Citoyen Prouski” (Sparrow, Secret Service 246-47; Phantom 72). Cities and place names were renamed so that even if Wickham’s letters were intercepted and decoded, no one but Grenville could make sense of them. William Wickham was from Yorkshire, the same county as Mr. Bingley in Pride and Prejudice. The real Wickham’s father went bankrupt and lost the family fortune and estate by gambling. (Imagine: a Wickham who gambles.) William Wickham owed his entire career to Grenville’s ability to offer him government jobs through the old boys network. Wickham married the daughter of a Swiss banker, a connection that would come in very handy when he wanted to launder money. In spite of the fact that his wife’s relatives were foreigners, many of Wickham’s in-laws were appointed, by William Wickham, to jobs working for him in the British government. Nepotism was not illegal, but Wickham’s appointment of foreigners to British government jobs was breaking the law. Wickham chose to ignore the fact. Like George Wickham’s accomplice, the duplicitous Mrs. Young, William Wickham’s underlings were a motley assortment of British agents who assisted Wickham in coordinating his French spies. British agent John Barnett attempted to recruit Napoleon’s mistresses as spies, and although some of the women supplied Barnett with a lot of titillating details about Napoleon’s dalliances, they do not seem to have provided any relevant information about the French military. As Mr. Bennet can attest, people do not have to pay for gossip. It seeks us out, in the form of Henry Tilney’s “‘neighbourhood of voluntary spies’” (NA 198). Failing to get any information from Mr. Bennet, his wife and daughters “were at last obliged to accept the second-hand intelligence of their neighbor Lady Lucas,” whose call on the Bennets is described as a “report” (PP 9). Lady Lucas’s information is plentiful and free, but also unreliable. How many ladies and gentlemen is Charles Bingley bringing to the Meryton assembly? Collective Meryton seems sometimes to do better, as “the report which was in general circulation within five minutes after [Darcy’s] entrance, of his having ten thousand a year” is true enough (PP 10), and this instance illustrates the point that the truth is general knowledge, not a secret known only to a few who must be paid to tell it. Many, if not most, of William Wickham’s spies were no more reliable than Lady Lucas, but they were no less active in supplying information or disinformation. Wickham usually paid spies by the job, so the more reports they turned in, the more money they earned. Wickham filed so many dispatches and reports that much of his paperwork remained unopened and unread, languishing in the Foreign Office for twenty years. But even unread reports had been paid for, and spies did not come cheap. The most famous and probably the most useless spy on the British payroll was a French dragoon officer, Chevalier d’Eon de Beaumont. Beaumont was known to be a triple agent. No one could trust Beaumont, but everyone employed him. As a spy, he often went undercover dressed as a woman. For the first forty-nine years of his life, Beaumont appeared publicly as a man, but at the age of fifty, he claimed to be a woman and began wearing women’s clothing. From the age of fifty-seven until his death at eighty-one, Beaumont was a prominent London socialite, though how much insight into French military maneuvers he was able to provide from an English drawing room is questionable. An expert swordsman, Beaumont gave public fencing demonstrations, including a duel staged for the Prince of Wales. Beaumont’s flamboyant and conspicuous lifestyle made it impossible for him to do anything by stealth. 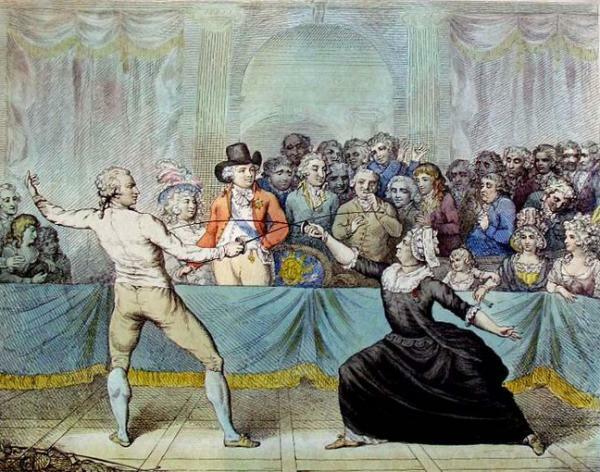 The Assaut or Fencing Match, Carlton House, April 9, 1787. Jane Austen would have heard rumors about the Scarlet Pimpernel’s exploits, but only William Wickham knew the identity of his most successful spy. The fictional Scarlet Pimpernel of Emma Orczy’s 1905 play and novels is an English aristocrat, but the real Scarlet Pimpernel was a young Frenchman, Louis Bayard. Only twenty-six when Wickham recruited him in 1795, Bayard was a master of disguise who assumed thirty-one aliases. French émigrés were admitted into England without a passport if they could produce a triangular card with a red flower emblem, the Scarlet Pimpernel’s calling card (Sparrow, Phantom 2, 91). Jane Austen’s cousin and sister-in-law, Eliza de Feuillide, lived in London among the exiled French nobility, whose stories of the Pimpernel’s exploits had made him a legend in his own time (Le Faye 133). Bayard was able to avoid capture until 1804, when he was arrested. Unable to determine Bayard’s identity, the French released him. Bayard immediately escaped to England, changed his name, and disappeared, the damned elusive Pimpernel to the end. William Wickham had his espionage failures and his successes. At least two assassination attempts and one kidnapping plot went awry; Napoleon learned that he could not travel to the opera in peace (Sparrow, Phantom 143, 159). Wickham’s greatest espionage triumph had to be the Treaty of Tilsit. Napoleon and the Tsar of Russia planned a joint invasion of England and negotiated a treaty on a raft in the middle of a river in order to assure secrecy. The Treaty of Tilsit was kept secret for eighty-four years, but the exact terms of the treaty were known in London within a few days. In The Phantom of the Guillotine, British espionage historian Elizabeth Sparrow speculates that this was the work of the Scarlet Pimpernel. Louis Bayard was so effective that he was given a regular salary of £1,000 a month (Sparrow, Phantom 149) and was employed in his capacity as a spy for nine years. Bayard’s £12,000 a year is a larger income than Jane Austen gives to Mr. Darcy, Austen’s wealthiest hero. Mr. Rushworth in Mansfield Park is Jane Austen’s wealthiest character, and his income only equals Bayard’s if we do not count Bayard’s bonuses. No doubt the Scarlet Pimpernel was Wickham’s best-paid spy, but he was hardly Wickham’s only spy. As Durey puts it, “Wickham controlled the purse strings,” and he saw the treasury as “a bottomless purse” (Master Spy 61, 99). The official secret service budget, approved by Parliament in 1805, was £172,830 (Judd 77-78). Wickham was required to account for this money, but most of Wickham’s operating budget was never officially approved and certainly never accounted for. In 1795, Wickham was secretly allocated 40% of the Foreign Office budget, more than £330,000 (Mitchell 259). Those two sources provided Wickham with more than half a million pounds a year, but he also drew funds from the Alien Office, the Home Office, the Treasury, and the Irish Office, and he siphoned off money from the military as “army extraordinaries” (Sparrow, Secret Service 56), which did not have to be explained. Additionally, both Grenville and Pitt gave Wickham thousands of pounds that he never had to account for. Wickham’s various political appointments—Superintendent of Aliens, Under-Secretary of State for the Home Office, Chief Secretary for Ireland, and Grenville’s most ironic appointments, a Lord of the Treasury and commissioner of bankrupts—were all really fronts for the secret service, making it easier for Wickham to funnel money, which disappeared through interdepartmental transfers. Since he destroyed the vast majority of his paperwork before leaving office, we can only speculate about how much money Wickham spent. In 1800, the Audits Office charged William Wickham with misuse of public funds, but Grenville and the Whig leader of the opposition, Charles James Fox, shielded Wickham from prosecution. The Audits Office found that Wickham had created an accounting nightmare. To further complicate matters, foreign banks were generally uncooperative with the Audits Office investigation, and the tangled money trail proved impossible to trace. Wickham had even opened a bank in Paris to provide the Scarlet Pimpernel with a disguise as a banker (Sparrow, Phantom 152). In 1806, the Audits Office demanded that Wickham explain his complicated bookkeeping, but Wickham refused: “With respect to the secret service money issued to me, . . . both Lord Grenville and Fox are clear in their opinion that it would be the height of imprudence and folly to have any account of it laid on the table” (qtd. in Sparrow, Secret Service 323-24). Wickham admitted to having spent one million pounds, but even Grenville acknowledged that the figure was much too low. The Audits Office had already determined that Wickham at least occasionally spent as much as £30,000 a week (Sparrow, Secret Service 69). (£30,000 is Miss Darcy’s dowry in Pride and Prejudice.) In 1806, Grenville became Prime Minister, and all investigation into Wickham’s mysterious accounting practices ceased. Jane Austen’s opinion of Prime Minister Grenville’s government is recorded in her poem “On Sir Home Popham’s Sentence, April 1807,” where she calls it “a ministry pitiful, angry [and] mean,” “foes . . . / who never do right” (MW 446). Having been publicly disgraced as a corrupt civil servant, William Wickham did a predictable thing. He became a Member of Parliament. As a Member of Parliament, Wickham rarely attended sessions and seldom spoke (Durey, Master Spy 192). In 1810, William Wickham retired, at the ripe old age of forty-three, with a government pension of £1,200 a year, approximately Captain Wentworth’s income in Persuasion. Wickham, however, experienced “much vexation” that the amount was so small: “I have been treated unkindly and unhandsomely by a government which I have served faithfully, zealously and with affection” (qtd. in Durey, Master Spy 190). Wickham left London to pout on his two estates in the country—though how he could afford to purchase two estates is unclear. Wickham’s primary residence was his Hampshire estate, Binstead, located four miles east of Alton. From 1810, William Wickham was living about five miles from Jane Austen’s home, Chawton Cottage. Three years after William Wickham’s retirement, Pride and Prejudice was published by one of his neighbors. Fitzwilliam Darcy’s final solution to the menace of George Wickham, transferring him into the regular army, suggests a better use of the secret service’s budget and manpower, the same solution that Admiral Horatio Nelson and the Duke of Wellington advocated. High-ranking military men had been long opposed to employing French spies, as Jock Haswell maintains in The First Respectable Spy: “Many commanders who considered themselves men of honour would have no truck with such people” (68). Historian Alexander Rose concurs: in the British “conventional military establishment, spies were regarded with distaste” (198). For one thing, military men distrusted information gleaned from spies, based on the premise that Frenchmen were more likely to deceive the British than to aid them. Commanders also knew that funds budgeted for the military were being siphoned off to pay spies, and, if that weren’t enough, they felt that spies were, at best, nuisances and, at worst, posed real threats to the safety of their soldiers and sailors. For instance, British agent John Barnett was particularly bad about commandeering navy ships for his spy missions and requisitioning ships as rendezvous points. Ship captains whose military missions had to be put on hold and who were forced to sail into dangerous waters on Barnett’s orders intensely disliked him. They were highly skeptical of Barnett’s tactics and were contemptuous of Barnett’s agents, whom they saw as enemy Frenchmen boarding their British ships to count the men and cannons. Officers in the military had been advocating a much cheaper, more reliable, and more honorable alternative to Wickham’s secret service. Head of the British navy, Admiral Horatio Nelson, relied on the reconnaissance of his own captains sailing scouting frigates, small, fast, maneuverable ships that could sail in close to the enemy for observation and then quickly escape. In 1804, Captain Francis Austen, Jane Austen’s brother, had this assignment at Deal (Royle 126; Pocock 126). Captains of scouting frigates reported directly to Nelson. The Duke of Wellington, Commander of the British army, shared Nelson’s aversion to spies and used his own “exploring officers” or “field intelligence officers” for reconnaissance (Crowdy 152). Wellington’s exploring officers generally worked alone, riding in close to the enemy on horseback, observing, and then escaping before they could be apprehended, the same tactics used by the navy. Like Nelson, Wellington acted as his own head of intelligence, and Wellington’s reconnaissance officers, like Nelson’s, reported directly to him. As these soldiers and sailors were dressed in military uniform and acting under orders, they were considered to be the first “respectable” spies (Haswell 133). Wellington had three requirements for his exploring officers. They had to be brave, be good horsemen, and speak fluent French (Haswell 132). Fluency in Spanish was a further recommendation, and artistic ability was a bonus, although Wellington provided his exploring officers with training in art and cartography, as they routinely made quick sketches of fortifications and terrain and drew maps while in the saddle. George Wickham is certainly brave; he not only takes risks but seems to enjoy the excitement. Wickham is also adept at escaping, even when encumbered with Lydia Bennet. Raised on the Darcy estate, George Wickham would have ridden horses from childhood, and he has been well educated by Mr. Darcy’s father, so he could be expected to be fluent in French and to have had at least basic art lessons. And, of course, his death would be no great loss to the nation. When Fitzwilliam Darcy buys George Wickham a commission in the regular army with General ——’s Northern regiment, Darcy may be placing Wickham under Colonel Fitzwilliam’s command. Darcy’s cousin is well acquainted with George Wickham’s weaknesses but also with his possible usefulness to the military. As an exploring officer, Wickham would be bound for the front lines, and there would be no more mysterious disappearances, or Wickham would be shot for desertion. George Wickham’s placement in the regular army may suggest that espionage activities are much better carried out by the military rather than by foreign traitors and that the money then being spent, possibly wasted, on bribing spies could be better used to supply the army and navy. Two years after the publication of Pride and Prejudice, the battle of Waterloo ended the war with France, and the British secret service was rapidly dismantled. As Michael Durey notes, British espionage returned to part-time work: “The British secret service . . . did not disappear with Wickham, but the idea of a comprehensive, integrated and centralized intelligence centre went with him into retirement. . . . It was not to be revived until the twentieth century” (Master Spy 137). Comparable to the FBI in the United States, MI5 was built from scratch for the Boer War, but this time British citizens were trained instead of employing foreigners as spies. Rudyard Kipling’s 1901 novel Kim celebrates the new professionalism of the British secret service. A young and feisty cavalry officer, Winston Churchill, acted as a spy in the Boer War. MI5 expanded during World War I, and MI6, comparable to the CIA in the United States, was born in the 1930s. So how did Jane Austen avoid being sued or assassinated? Austen changed her character’s first name to George instead of William. Her fictional Wickham has attended Cambridge instead of William Wickham’s Oxford, and George Wickham hails from Derbyshire, next door to William Wickham’s Yorkshire. That was change enough at the time to shield an author or publisher from charges of libel. As Mrs. Gardiner says, “‘slyness seems the fashion’” (PP 325). And Jane Austen avoided assassination by publishing anonymously.